Hundreds of Chevrolet dealers are preparing their stores for what could be one of the most significant boosts for their fixed operations business in a decade. "There is a huge amount of business that's been waiting for us to get back into this market and business," said Mike Bowsher, chairman of the Chevrolet National Dealer Council. Bowsher, owner of Carl Black Automotive Group, in Kennesaw, Ga., is one of more than 400 Chevy dealers who have agreed to sell medium-duty commercial trucks, including new Chevrolet Silverado 4500HD, 5500HD and 6500HD trucks that are scheduled to go into production in early December. Dealers across the country — from Carl Black's Chevrolet stores in Georgia to Silveira Chevrolet in Sonoma, Calif. — have been anticipating the arrival of such trucks for months, if not years. "Those of us who lost medium-duty in the past, we lost a lot of service business, and we lost a lot of gross profit due to those sales going away," Bowsher said. GM exited the medium-duty segment as part of its 2009 bankruptcy, allowing Ford Motor Co. to increase its commercial leadership position and Fiat Chrysler Automobiles' Ram to expand its business. Many Chevy dealers re-established medium-duty operations two years ago to support the brand's low-cab-forward trucks, but the Silverado medium-duty trucks are expected to be the bread and butter of Chevy's new commercial lineup. "We have a number of dealers that are going to grow their facility for either stocking or service or just building an adjacent building for the expansion," said John Schwegman, director of commercial product and medium duty at GM Fleet. "It's not about what's the minimum requirement. It's about 'How do I maximize my return for this opportunity?' because they see it as a significant opportunity." Requirements include training for sales and service staff on commercial vehicles as well as parts and other specifications such as service door heights and lifts to accommodate the trucks. GM said about a third of the more than 400 medium-duty dealers are new to the business or are re-establishing their operations for the medium-duty Silverados. GM has established a "Commercial College" to help train dealers for the medium-duty trucks, including the low-cab forwards, which dealers are required to sell alongside the Silverados, according to Paul McKay, manager of commercial dealer operations. About 2,000 people are expected to be trained as part of the program, which is a mix of on-site, online and remote training for sales and service staff. "What we want to just make sure is when these [medium-duty] customers call or they come visit, we want to make sure our dealership partners are ready to meet the needs of that customer," McKay said. Silveira Chevrolet, a newcomer to Chevy's medium-duty truck business, has installed two service bays and plans to add sales and technician staff as needed, according to Darron Kendall, commercial-sales manager. Silveira, he said, decided to enter the business to offer a full line of vehicles for its customers, including a "large number of clients" in the wine business in Sonoma and Napa counties in Northern California. "By being able to handle all of their vehicles, we can ensure that we maintain a great relationship with them to ensure that all of their vehicle needs are met," said Kendall, who declined to disclose how much the dealership has spent on meeting medium-duty requirements. GM previously estimated the cost to meet the requirements at $100,000 to $200,000. Incremental training and parts could cost $10,000 to $15,000 for those dealers. Others such as Randy Marion already have the infrastructure in place and have continued to service commercial vehicles despite GM exiting the segment. "We've been out of the game, but now we're getting back into the game," said Marion, owner of Randy Marion Chevrolet-Buick-Cadillac in Mooresville, N.C. "We're really excited." Marion, one of Chevrolet's highest-volume commercial dealers in the country according to GM, has about 40 employees working on its commercial business. He said that number could increase as the dealership gets more business from the Silverado trucks. GM executives have said they expect three adjacent sales of other vehicles with each medium-duty truck sold. That, according to officials, should translate to additional fixed-operations business. "It could be and should be significant," said Keith McCluskey, owner of McCluskey Chevrolet in metropolitan Cincinnati. "If there's that many adjacent sales, then let's extrapolate that into the fixed operations." 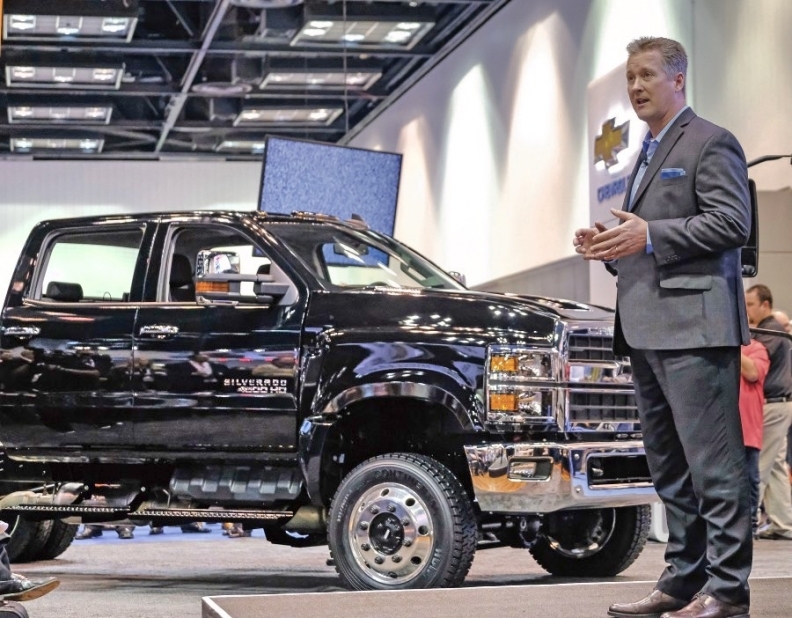 Another main dealer-led focus as GM prepares to launch the Silverados is ensuring dealers offer extended "priority service" hours for medium-duty customers to expedite maintenance and repairs, according to McKay. "These medium-duty customers have high expectations and doing service work during just normal business hours doesn't always work," he said. For example, McCluskey Chevrolet is already open seven days a week with service hours for retail customers, including until 3 a.m. weekdays. The store plans to keep those hours for its medium-duty business, including an early-morning pickup. "It's an important part of the business," McCluskey said. "It can be a very high volume model for those of us who focus on it."